Bramon Restaurant and Cellar caters for tailor made functions and weddings. 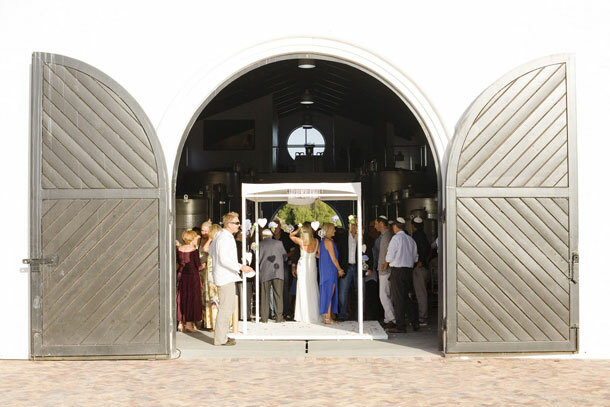 Ceremonies can take place in the restaurant, set uniquely in the vineyards and gardens overlooking the Elephant Sanctuary and Tsitsikamma Mountains or in the cathedral like cellar, overlooking the elephants. This family owned and run estate named after Peter and Caroline Thorpe’s children, Bram and Manon, is the first wine estate this far east of the Western Cape! The restaurant seats 70 people inside and 110 outside, in between the vines and under the canopy adding greatly to the ambiance and expanse of the indoor / outdoor feel Bramon has become synonymous with. It is perfect for winter weddings too or on chillier days, as the restaurant is warmed by a toasty central fireplace. Whatever the weather your wedding will always shimmer at Bramon! Cellar weddings seat 150 pax comfortably with guests sitting between the vats and wines of the working cellar for a venue with a bit of a difference! The acoustics are rated very highly and bring a tear to more than just the bride’s eye. Your special day is handled by our efficient and imaginative events management team and staff – from the unusual little extras, menu’s to suit all taste buds and needs, to decor, tent and musician hire. Whether you want Bramon’s famous mezze for a wedding with a delectable twist or opt for a tailor made menu, our team and management tailor-make your dream wedding to ensure an organoleptic feast! To book this gorgeous venue visit Bramon Wine Estate. Ooooh, if I was having a destination wedding I think this would be my venue! Gorgeous.